Is age a bit of a red herring? Patrick Leclezio explores one of the burning whisky questions of our time. 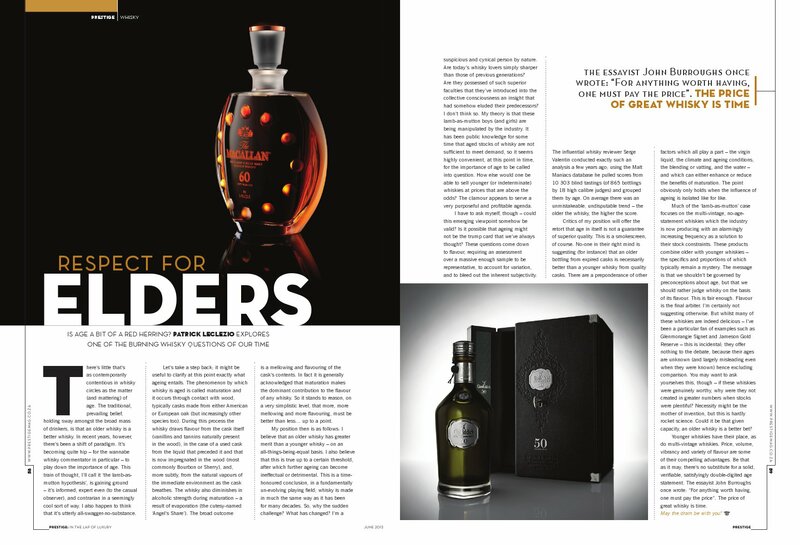 First published in Prestige Magazine (June 2013 edition). There’s little that’s as contemporarily contentious in whisky circles as the matter (and mattering) of age. The traditional, prevailing belief, holding sway amongst the broad mass of drinkers, is that an older whisky is a better whisky. In recent years however there’s been a shift of paradigm. It’s becoming quite hip – for the wannabe whisky commentator in particular – to play down the importance of age. This train of thought, I’ll call it the lamb-as-mutton hypothesis, is gaining ground – it’s informed, expert even (to the casual observer), and contrarian in a seemingly cool sort of way. I also happen to think that it’s utterly all-swagger-no-substance erroneous. Let’s take a step back; it might be useful to clarify at this point exactly what ageing entails. The phenomenon by which whisky is aged is called maturation and it occurs through contact with wood, typically casks made from either American or European oak (but increasingly other species too). During this process the whisky draws flavour from the cask itself (vanillins and tannins naturally present in the wood), in the case of a used cask from the liquid that preceded it and that is now impregnated in the wood (most commonly Bourbon or Sherry), and, more subtly, from the natural vapours of the immediate environment as the cask breathes. The whisky also diminishes in alcoholic strength during maturation – a result of evaporation (the cutesy-named Angel’s Share). The broad outcome is a mellowing and flavouring of the cask’s contents. In fact it is generally acknowledged that maturation makes the dominant contribution to the flavour of any whisky. So it stands to reason, on a very simplistic level, that more, more mellowing and more flavouring, must be better than less…up to a point. My position then is as follows: I believe that an older whisky has greater merit than a younger whisky – on an all-things-being-equal basis. I also believe that this is true up to a certain threshold, after which further ageing can become ineffectual or detrimental. This is a time-honoured conclusion, in a fundamentally un-evolving playing field; whisky is made in much the same way as it has been for many decades. So, why the sudden challenge? What has changed? I’m a suspicious and cynical person by nature. Are today’s whisky lovers simply sharper than those of previous generations? Are they possessed of such superior faculties that they’ve introduced into the collective consciousness an insight that had somehow eluded their predecessors? I don’t think so. My theory is that these lamb-as-mutton boys (and girls) are being manipulated by the industry. It has been public knowledge for some time that aged stocks of whisky are not sufficient to meet demand, so it seems highly convenient, at this point in time, for the importance of age to be called into question. How else would one be able sell younger (or indeterminate) whiskies at prices that are above the odds? The clamour appears to serve a very purposeful and profitable agenda. I have to ask myself though – could this emerging viewpoint somehow be valid? Is it possible that ageing might not be the trump card that we’ve always thought? These questions come down to flavour, requiring an assessment over a massive enough sample to be representative, to account for variation, and to bleed out the inherent subjectivity. The influential whisky reviewer Serge Valentin conducted exactly such an analysis a few years ago; using the Malt Maniacs database he pulled scores from 10 303 blind tastings (of 865 bottlings by 18 high calibre judges) and grouped them by age. On average there was an unmistakeable, undisputable trend – the older the whisky the higher the score. Critics of my position will offer the retort that age in itself is not a guarantee of superior quality. This is a smokescreen of course. No-one in their right mind is suggesting (for instance) that an older bottling from expired casks is necessarily better than a younger whisky from quality casks. There are a preponderance of other factors which all play a part – the virgin liquid, the climate and ageing conditions, and the blending or vatting – and which can either enhance or reduce the benefits of maturation. The point obviously only holds when the influence of ageing is isolated like for like. Much of the lamb-as-mutton case focuses on the multi-vintage, no-age-statement whiskies which the industry is now producing with an alarmingly increasing frequency as a solution to their stock constraints. These products combine older with younger whiskies – the specifics and proportions of which typically remain a mystery. The message is that we shouldn’t be governed by preconceptions about age, but that we should rather judge whisky on the basis of its flavour. This is fair enough. Flavour is the final arbiter. I’m certainly not suggesting otherwise. But whilst many of these whiskies are indeed delicious – I’ve been a particular fan of examples such as Glenmorangie Signet and Jameson Gold Reserve – this is incidental; they offer nothing to the debate, because their ages are unknown (and largely misleading even they were known) hence excluding comparison. You may want to ask yourselves this though – if these whiskies were genuinely worthy why were they not created in greater numbers when stocks were plentiful? Necessity might be the mother of invention, but this is hardly rocket science. Could it be that given capacity an older whisky is better bet? Younger whiskies have their place, as do multi-vintage whiskies. Price, volume, and vibrancy and variety of flavour are some of their compelling advantages. Be that as it may there’s no substitute for a solid, verifiable, satisfyingly double-digited age statement. The essayist John Burroughs once wrote: “For anything worth having one must pay the price”. The price of great whisky is time. May the dram be with you! This entry was posted in Whisky column and tagged whisky; whiskey. Bookmark the permalink.